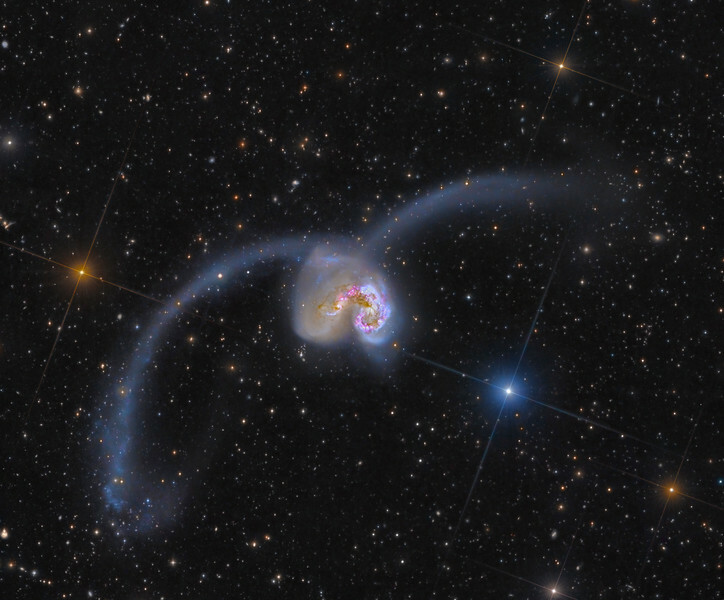 This image is a collaboration between astrophotographers Federico Pelliccia of Italy and Rolf Wahl Olsen of New Zealand and shows an ultra-deep and detailed view of the famous Antennae colliding galaxies in Corvus. The image was constructed from a number of sources: First a mosaic of panels from the 8.2m Subaru telescope was very patiently put together by Federico Pelliccia. This data was subsequently blended with Rolf Wahl Olsen's Antennae Galaxies Extreme Deep Field - 75 Hours to bring out the faint tidal streams and large scale structures which was not present in the high resolution Subaru data and this deep image also provided the colour information. The core was further enhanced by overlaying an extremely detailed frame from the Hubble Space Telescope. Together this data represents the deepest and highest resolution view available to date covering the entire Antennae galaxies. RA 12h 01m 53.30s, Dec -18° 52' 31.37"
The Hubble image uses visible and near-infrared observations from Hubble’s Wide Field Camera 3 (WFC3), along with some of the previously-released observations from Hubble’s Advanced Camera for Surveys (ACS).